When discussing worldviews we need to understand that all worldview start from a basic belief system which is used to describe the way life really is. However, even within Christianity there are various denominational and theological beliefs that actually wind up establishing their own view of reality. The reality is that every theological system has its own unique worldview. In this section we will examine some of these basic theological systems and the worldview they produce. The lesson here is to show that knowing what the presuppositional beliefs are when examining worldviews is critical. Even within Christianity we have widely varying views of reality depending on what one's basic theology is being used to define reality and how life works out, according to one's interpretation of the Bible. Eschatology comes from two Greek words meaning last (ἔσχατος, last) and study (λογία, lit. discourse). It is the study of the end of things, whether the end of an individual life, the end of the age, or the end of the world. Broadly speaking, Christian eschatology is the study of the destiny of mankind as it is revealed in the Bible, which is the primary source for all Christian eschatology studies. The major issues and events in Christian eschatology are death and the afterlife, Heaven and Hell, the Second Coming of Jesus, the Resurrection of the Dead, the Rapture, the Tribulation, Millennialism, the end of the world, the Last Judgment, and the New Heaven and New Earth of the World to Come. Eschatological passages are found in many places in the Bible, both in the Old and the New Testaments. There are also many extrabiblical examples of eschatological prophecy, as well as church traditions. The study of eschatologies is important because what we believe to be true about the future will affect what we do in this lifetime. It can mean the difference between a faith with a strong vision of spreading God's kingdom through out the world or a passive that believes the church is destined to lose to the forces of evil making it necessary for Jesus to return as King and set things right by establishing an earthly political kingdom. There are three major eschatologies called amillenialism, premillenialism and postmillenialism. Each of these views will influence the trajectory for a Christian takes with regard to how they live out their faith within their lifetime. As rational creatures we plan for what we believe will be the future. As we study the three eschatological views we will come to understand that ideas really do have consequences. This is why it is critically important that Christians study the impact of different ideas. Too often Christians adopt belief systems they learned in church assuming them to be correct. For many, once they do the research into the historical origins of eschatologies, change their perspective. We need to know the facts behind the views in order to make an informed and intelligent choice. In this section I will be presenting the origins, beliefs and how the ideas influence Christian worldviews and the behavior of Christians. In theological jargon eschatology refers to projections of the future according to how some people interpret Bible prophecy. This can have a devastating effect on the way that Christians prepare for the future. If you truly believe that the end is near, would you really waste time and prepare for a long-term future? If you are a young person and all you have ever heard in your church is that the Lord is almost here and that we are getting raptured any second, would you really plan for a long-term future if you actually believed this to be true? Unfortunately, well meaning prophecy writers have had a fatalistic influence on the way that the church relates to the culture. An example of this is famous dispensational evangelist D.L. Moody. When someone asked him what the relationship of Christians shoud be with regard to culture redemption, he said "Don't polish the brass on a sinking ship!" In other words, don't waste your time trying to address cultural issues in this life. The implication is that it would be a waste of time since Jesus is almost here and He will remove us from the earth in an event known as the "secret rapture" of the Christians. There is only one problem with this scenario. It in unscriptural in that it undermines the Great Commission given by Jesus. Jesus said that we are to "disciple the nations, teaching people all that He has revealed to us." This biblical revelation is also known as the "Cultural Mandate." Moody's response directly contradicts what Jesus has commanded us to do until He returns. This helps to explain why the church has not been effective in discipling its own members, much less the nations of the world. According to social researcher George Barna, disciple is non-existent in our churches. This is a real tragedy in light of all the biblical revelation and mass communication available to the evangelical church. Please check out the related articles in this section and determine whether your church has been faithful to what Jesus commanded us to accomplish both in the Great Commission and the Cultural Mandate. If your church does not take these commands given by Jesus seriously, then addess the problem or find another church that is fulfilling the last command given by Christ to His church. We are to be faithful to what Jesus has called us to do, establish His kingdom, inspite of what the future may look like. The following article explains further how bad theology can misdirect the mission of the church. There is a lot of wailing right now about the coming crash, the mid-east spoiling for war, Israel at battle stations, and the general unwinding of the American system. There are a whole lot of my evangelical brethren who believe we are at the end of the age. Not just the end of politics as we know them but the end of the entire book of history. There is a sense of desperation on the nerve as of those without hope, or of men who believe their end is branded in time with prophetic surety. Churchmen grapple in political holds and throws attempting to slow what they have been assured by their fellows is the defeat of the church in this world and the relentless victory of the evil kingdoms. Not for eternity mind you, but in this world now, which is of course where we live and expend our souls from birth to the coffin. So, by the popular view we are to muster up some fight even though we are certain of the futility of our actions. It is generally unspoken that the logic for the fight is missing and the only rational thing to do is to hide out and wait for the end. We are not always logical so some are consumed heart and mind in the political fray while others do nothing. A goodly portion of the modern church is expending itself on busyness programs, programs, programs that have never, and never will, achieve their purported ends. There is not much hope in the popular theology. Yet, as I read the words of Christ about His kingdom I see nothing but hope. And I do not mean just hope for the eternal arrangements beyond this life. I mean hope for every King’s child in this world and the next. Jesus never talks about His kingdom as a failing kingdom or one that will have to be rescued from its conquering enemies by a last moment miracle. Rather, He speaks of His kingdom as a mustard seed that grows steadily into a tree that fills the garden or as leaven that eventually fills the whole loaf. He prayed, ‘Thy kingdom come thy will be done on EARTH as it is in heaven’. Hence, we are not misled when we expect that His kingdom is maturing on this earth and advancing into heaven. We ought to expect to see the maturing of the mustard seed just as He said. The fig tree He cursed but the mustard tree is to fill the garden. Another thought we have allowed to slip away is that the kingdom is a real, historical, kingdom not just a metaphor for some sort of spiritual rule. When Jesus talked about the kingdom as leaven He was not trying to communicate that when we reach heaven then the kingdom will slowly expand. No, He was speaking of a kingdom that expands on earth. The reference to kingdom is no mistake either. It is not a sloppy use of familiar language. What Jesus is talking about is an entire civilization that grows up within the existing civilizations and eventually over powers them and becomes the dominant civilization, or kingdom. The kingdom of Christ is to be the dominant kingdom. Christ the King will rule all other kings. His law will rule the nations. ‘Ask of Me and I will give the nations as thine inheritance’ (Psalm 2) promises the Father. All of the islands of the sea are His. This Christian civilization, this advancing kingdom, is what our historical forefathers referred to as Christendom. Christendom was the civilization of the kingdom of Christ. It was understood to be an unstoppable culture growing in this earth. Christendom was the light that was shinning truth and liberty to a darkened but awakening world. God’s law was the law of the Christian nation. Every nation has its law and so did theirs. The shock troops of its army were its missionaries who went forth to preach the ‘gospel of the kingdom’ as Jesus ordained. Christendom was the kingdom of light and hope in a hopeless world. Yet, now, we have become the hopeless ones. We have abandoned our Biblical theology for literal doctrines of devils. We have quit the fight for the kingdom and await our supposedly inevitable demise at the hands of our enemies. We have become citizens without a country and soldiers without a cause. All of this is unnecessary but our retreat is impermanent. The kingdom of Christ advances in ebbs and flows. The early church through the Middle Ages struggled its way across pagan Europe conquering as it marched through the centuries. The Renaissance marked a turning when Europeans were deceived into looking back to the Greeks and Romans for wisdom instead of Scripture. Martin Luther’s Reformation ignited the ancient light of the church and shone its brightness once again on what had become a dark continent indeed. As the strength of the Reformation faded sinful men once again ran to embrace humanistic philosophies in what humanist historians call the Enlightenment (meaning that humanism is the brightening light and Christendom is the darkness). Now, it appears we are dwindling, perhaps racing, toward the end of the Enlightenment era. The secularist management of the world’s affairs has led to tyranny and bankruptcy on every front. Western civilization as it is presently being managed is simply not sustainable. We understand from the prophets that God uses pain and trouble to reignite faith and obedience in His church. This then is the season of opportunity for the church. I remember watching Mel Gibson as William Wallace pacing on horseback before his troops beseeching them ‘if only you will fight’. That is the emotion for the church at this hour. If only we will fight. If only we will return to the battlefield. We may need an increase in numbers but what we need more is an infusion of theologically sound hope. We must believe that the battle is ours in Christ. The Spirit and the sword of His word are sufficient weapons to conquer nations if we do not run from the field. This may be the end of an era but it is not the end of the age. Christendom will advance if we have the commitment and wisdom to carry the banner. This is our duty for the King and for future generations. Kirk Cameron has an interesting insight on this issue. He equates eschatology with a common theme found within the movie industry. The bottom line is that God is in control of history and He holds the future. We are called to be faithful to what we have been instructed to do, and that is to fulfill the Great Commission until he returns. Until then, we fight to disciple the nations of the world. This implies both personal and cultural redemption. Apologetics is the branch of theology that is concerned with the defense or proofs of Christianity. The systems of apologetics favored by an individual often reveals the Christian worldview they hold and the role human reason plays in that worldview. There are basically two types of apologetics. One is called evidentiary apologetics and the other is presuppositional apologetics. The other approach is called presuppositional apologetics. This school believes the Christian faith is the only basis for rational thought. It presupposes that the Bible is the revelation of God. It attempts to expose flaws in other worldviews. Adherents to this view claim that apart from presuppositions, one could not make sense of any human experience. They claim there can be no set of neutral assumptions from which to reason with a non-Christian. Presuppositionalists do not believe a Christian can consistently declare his belief in the existence of the God of the Bible and then turn around and argue on the basis of a different set of assumptions that God may not exist and Biblical revelation may not be true. Presuppositionalism is the predominant apologetic of contemporary conservative Calvinist and Reformed churches. Two schools of presuppositionalism exist. One is based on the teachings of Cornelius Van Til and the other on the teachings of Gordon Clark. According to John Frame, "a presupposition is a belief that takes precedence over another and therefore serves as a criterion for another. An ultimate presupposition is a belief over which no other takes precedence. For a Christian, the content of Scripture must serve as his ultimate presupposition.... This doctrine is merely the outworking of the lordship of God in the area of human thought. It applies the doctrine of scriptural infallibility to the realm of knowing." The way one approaches apologetics is important to know. Every theological perspective reflects a unique worldview. That unique worldview will determine how the Gospel will be applied in the real world. Ideas have consequences. This is one area where this can clearly be seen. The major points of disagreement between the approaches to apologetics revolve around the role that human reason and the Bible should play in the development of the Christian worldview. The Reformed stream is more bible-focused when it comes to the way it develops its system of ethics and its cultural application of the faith. The non-Reformed streams tend to rely more on both biblical revelation and human reason in deriving the details for how their worldview will relate to ethics and the culture. My own perspective is presuppositional. I believe we need to learn from the lesson God revealed with Adam and Eve. Satan got them both to question God's revelation by appealing to them to use their human reasoning to rationalize that God was holding out on them. Our human reasoning must always be in submission to God's revealed will in the Gospel. We reason starting with what God has already revealed to us as the truth. We get into trouble when we believe that our human reasoning has not been dramatically affected by our fallen human natures and that we can independently find truth. We need to learn the lessons of the Bible that God is our source for ultimate truth. We are prone to human pride believing that we can reason on our own without depending on the revelation and leading of God. With regard to using evidence to convince people the Gospel is true, I think that belief can be overly optimistic. The Apostle Paul in Romans 1 teaches us that what may be known about Him is self-evident. He stated that people purposely turn away from what they know to be true regarding God and His Creation. The evidence of God's reality is clearly revealed to all people by God, yet they reject that truth "purposely" in order to do their own thing. No amount of evidence is going to convince an individual that the God is real. God says that they already know it and that they have purposed to turn away from God and his revelation. The issue is one of the heart. People are in open rebellion against a God that they want no part of. The reality is that we all want to be God, determining truth ourselves. We do not want to submit to God. Until that rebellious heart attitude is confronted, all the evidence in the world will not convince people of something God says they already know. While evidential apologetics may help to bolster the faith of a struggling Christian, according the Scripture, the evidence for God's reality is already known to people. In fact, there has never been a time like the present in which we have so much hard evidence to prove God existence and that the Gospel is true. Yet, non-believers really don't care. They ignore all the evidence that demands a verdict. The reality is that we all want to God and we are in open rebellion to what we already know to be true. So - what is a winning strategy to convince people that the Gospel is true? The Gospel teaches us to be ready to defend the faith when asked. But just as important is being able to relate to the people we are trying to share the Gospel with. 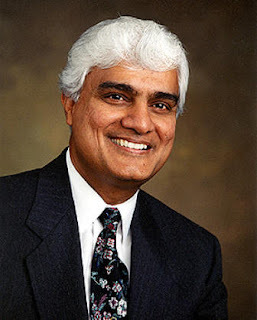 In the following two clips Ravi Zacharias presents a balanced approach to sharing the Gospel. We seek to reach both the head and the heart. This is also how we are to live out the balanced Christian life. While there is a valid view of two kingdoms which addresses the distinction between the jurisdictions of the church and the state, there is another view that also takes on this same name.This erroneous view is taught at Westminster Seminary in California primarily. However, it has not been refuted by Westminster in Philadelphia. This view generally teaches that God rules the church kingdom and that men rules the earthly kingdom. This sets up a dualistic split between two jurisdictions in which God has traditionally ruled over both. While he allows people to act as his representatives in these jurisdictions, they are ultimately accountable to Him for how they rule. Martin Luther's doctrine of the two kingdoms (or two reigns) of God teaches that God is the ruler of the whole world and that he rules in two ways. He rules the earth through both secular and church governments by means of law. In the secular kingdom men rule with the law of biblically revealed law and in the spiritual kingdom, that is, Christians He rules through the gospel or grace. The Two Kingdoms (2K) advocates teach that Christians have no dealings with regard to how the secular ruler governs. This leaves the secular rulers to rule as they see fit or under a form of law known as natural law. In natural law people supposedly have enough knowledge by what they know or what they observe in nature to rule effectively. Secular rulers have no obligation to submit to God and His moral expectations with regard to how he or she rules. The Germans had become accustomed to the doctrine of the "two spheres," which was interpreted to mean that Christ is Lord of the church, but the Kaiser (or Caesar) is, after a manner of speaking, lord over the political sphere...They witnessed to the saving grace of Christ but believed that the church's mission was only to preach Christ. Pietism, with its emphasis on personal devotion to Christ, was used to inject spiritual life into the mainstream Lutheran church. But by insisting that their faith was private and should not be brought into the political sphere, pietism had scant influence in stemming the Nazi tide...Those pious Christians thought that if they left Hitler alone, he would leave them alone. But many discovered that was not possible. Hitler also put pressure on them to have their children indoctrinated in the state schools and, thanks to the cultural pressure, their churches were not equipping members to stand against the abuses that were developing around them. (Erwin W. Lutzer, 2010, p. 17, 18). In light of the lack of influence by the Christianity within our culture, scholars are making the case that we have a similar situation in the United States with regard to a false view of the two kingdoms. They argue that a false pietism based on a distorted "two kingdoms" theology has resulted in impotent American churches. They point out that we currently have a repeat of the same church conditions that allowed the unopposed takeover of the German culture by the Nazis. This is an important issue in light of our nation's growing love affair with socialism and big government. The following links provide some good resources to learn more about this issue. Neoplatonism was a major influence on Christian theology throughout Late Antiquity and the Middle Ages in the West notably due to (1) St. Augustine of Hippo, who was influenced by the early Neoplatonists Plotinus and Porphyry, and (2) the works of the Christian writer Dionysius the Pseudo-Areopagite, who was influenced by later Neoplatonists, such as Proclus and Damascius. Christoplatonism is a term used to refer to a dualism promoted by Plato, which influenced the Church, which holds spirit is good but matter is evil. Today Christians that espouse this view of dualism see the Christian faith focused solely on the "spiritual" aspects of life - not the material or worldly aspects. The lordship of Jesus is relegated to the individual's spiritual life and not to the world or the culture. According to the Methodist Church and orthodox Reformed Christianity, Christoplatonism directly "contradicts the Biblical record of God calling everything He created good." God's redemptive plan is not just for the individual but for culture and His world as well. Theological views that advocate this view includes dispensational theology, Pentecostalism, Anabaptism, Plymouth Bretheren, Quakers, Menonites, Fundamentalist and some streams of evangelical theology. Calvinism is the theological system associated with John Calvin. It emphasizes the rule of God over all things (total sovereignty) as reflected in its understanding of God, the Gospel, salvation, and the church. The theology is also known as Reformed or Covenant theology. Calvinism refers to the Five Points of Calvinistic doctrine regarding salvation. If you want to see clear evidence of the connection between God and the United States, look at the life and beliefs of the Protestant reformer, John Calvin. July marks the 500th anniversary of his birth. Calvin never stepped foot on American soil, but his influence in the founding of this country is difficult to deny. CBN News took to the streets to discover that most people today associate the name, Calvin, with the comic strip character Calvin, of Calvin and Hobbes, or Calvin Klein. That is a shame according to Dr. Charles Dunn, dean of the Robertson School of Government at Regent University. Dunn agreed with the late Harvard historian George Bancroft who wrote, "He that will not honor the memory and respect the influence of Calvin knows but little of the origin of American liberty." Bancroft even called Calvin "the father of America." "We might dispute the degree to which he was the father of America," Dunn said. "But no one had as great an influence over such a breadth of ideas as John Calvin." Calvin developed many of those ideas while he was pastor of St. Pierre Cathedral in Geneva beginning in 1536 with ideas that transformed the city. Those ideas included education for the masses, not just the elite; the sacredness of all professions, not just the ministry; free market economic reforms; and checks and balances in civil government. "He understood the nature of government that you cannot grant power to just one authority because power corrupts and absolute power corrupts absolutely," Dunn said. "So there must be checking of power with power." These are ideas the early settlers brought to America a century later and appeared in documents like the Mayflower Compact and the U.S. Constitution. But perhaps Calvin's most significant work was his Institutes of the Christian Religion. Dunn called it "The most brilliant theological document since the New Testament." Five centuries later, it is still in print in two volumes. In it, Calvin set out to explain what the Bible had to say about God, man, creation, sin, justification by faith, the church and the sacraments, among other things. But the theme throughout is the sovereignty of God in all of life, including salvation. Today, Calvinism, or reformed theology as it is also called, is a small minority of the evangelical movement. But it is making a comeback in places many evangelicals have avoided. Redeemer Presbyterian Church in the heart of Manhattan, N.Y., is drawing hundreds each week to hear the preaching of Reverend Tim Keller. And at Mars Hill Church in Seattle, Wash., Mark Driscoll uses an edgy, multi-media presentation to tackle Calvinism's most controversial doctrines, including predestination. "Some Christians say God chose those that He knew would choose Him," Driscoll exclaimed in one sermon, "The only problem is the Bible says no one seeks God, no one looks for God, no one desires God, no one chooses God." Mars Hill is one of many churches countering the popular notion that Calvinism is too traditional, even stodgy. Driscoll characterizes himself as a "Charismatic Calvinist." And he is one of the reasons Time magazine recently proclaimed "The New Calvinism" one of the 10 ideas changing the world right now. Nowhere is Calvinism's resurgence more obvious than on college campuses across the country. In fact, at the University of Virginia in Charlottesville, one of the most popular campus ministries is called Reformed University Fellowship. On the night CBN News visited the campus, more than 100 students turned out for what amounted to a Tuesday evening worship service. Kelly Lersch, who attends regularly, was surprised by how many people participated. "People come and they bring their Bibles and I wasn't used to that growing up in church," she said. "I mean, you talked about what the Bible says, but you didn't really bring your Bible to church and so, yeah, that was really different." Greg Thompson is senior pastor at Charlottesville's Trinity Presbyterian Church, popular among University of Virginia students. He told CBN News what he heard from them when they first encounter reformed doctrine. "I didn't know the world mattered so much," he said. "I didn't know the Bible mattered so much. I didn't know I was so messed up and how sufficient Jesus' work for me, my salvation. This is big. And, of course, it is big." And that realization, Thompson said, brings a cultural benefit that Geneva saw during Calvin's time. He said Calvinism is providing young people who want to be social activists with "a theology that's basically born out of the goodness of Creation, the radical corruption of the Fall and Jesus's salvation; His lordship over all things, not must my little soul." Calvinism's resurgence is the subject of the book Young, Restless, Reformed written by Christianity Today's Collin Hansen. "There's a need for a rigorous Christianity; a Bible-based, rigorous Christianity that can hold up during these times," Hansen said. "Even a place like Time magazine is recognizing that an evangelicalism that tries to parrot the culture around is an evangelicalism that will perish with the culture around it." Hansen is hopeful that more Christians will revisit and reclaim the tenants of the Reformation that transformed a church and a city five centuries ago. James White introduces Reformed theology. The question of human life is a foundational concept that relates to many other issues. This is because according to Christianity, every person is made in the image of God. This makes every person unique and the role of the state is to protect all individuals from harm. The Founding Fathers placed a high priority on the protection of individual human life from the government. They realized that once the government is given the prerogative to define what human life is, then the road to tyranny is not far behind. God placed a high priority on the protection of life because we all made in his image. The global flood became a necessity because of the excessive violence and murder that was common in Noah's era. God had to wipe out the human race and start all over again through the lineage of Noah's family. To make sure that the spirit and acts of murder were contained, God instituted capital punishment as soon as Noah and his family left the Ark to repopulate the earth. The death penalty for murder even preceded the giving of the Ten Commandments to Moses at Mt. Sinai and is still binding on all mankind today. "Surely for your lifeblood I will demand a reckoning; from the hand of every beast I will require it, and from the hand of every man's brother I will require the life of man. Whoever sheds man's blood, By man his blood shall be shed; For in the image of God He made man." Genesis 9: 5, 6. The life issue is extremely important, especially when it comes to retaining our liberty. This is one of the reasons the issue of abortion is such an important dilemma facing our nation and the church. The next article covers the problem in more detail. The focus of the argument by Remonstrant Arminianism centers in the assertion that human dignity requires an unimpaired freedom of the will. God's sovereignty is limited and cannot override the human free will. Many Christian believers have been swayed by Arminian views. The Baptists in the 16th century, the Methodists and the Congregationalists of the early New England colonies in the 17th and 18th centuries and the Universalists and Unitarians in the 18th and 19th centuries. Arminianism refers to those who uphold the original beliefs of Jacobus Arminius which is a common way to define Arminianism. Hugo Grotius, John Wesley and other church leaders supported Arminian views. Classical Arminianism and Wesleyan Arminianism are the two main views. Wesleyan Arminianism is the theology of Methodism. Arminianism has been altered to some extent by Semipalagianism and Pelagianism, even though the advocates of Arminianism would likely disagree with this observation. A problem I see with this view is that it undermines the Reformed view regarding the depravity of mankind. In many ways it supports the secular humanist view of the Enlightenment which had a very positive view of both human nature and human reasoning. That viewed seen mankind as basically good - not sinful. So - we have two diametrically opposed views of human nature which will result in different worldviews. But even more important is what the Bible teaches about this issue. For those interested in pursuing the issue in more depth please refer to the resources below. In the following video clip John MacArthur presents an overview of Reformed theology and refutes Arminiamism showing that the Reformed view has been historically the orthodox position.